If you haven’t checked it out in the past, check out the redesigned Music And Technology – Resources for the Recording Musician blog. I’ve switched over to a more modern blog format. 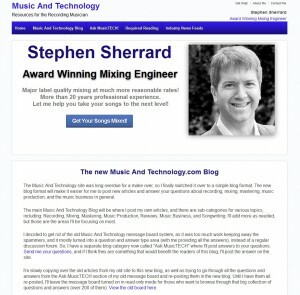 The site features many articles that I have written over the years on subjects such as Music Production, Recording, Mixing, Mastering, Songwriting, and the Music Business. Also features reviews and recommendations. The most popular feature of the site is the Ask MusicTECH blog category. Ask MusicTECH was a category in my old message board system on the site. However, that message board system will be going away. I had already shut down new user registration due to the large amounts of spammer registrations I had to sort through every day. The Ask MusicTECH category was the only category being used anyway, so I decided to switch it over to its own blog category, where I’ll slowly be re-posting the most popular and useful questions and answers from the old board. I have now set up a new page where you can submit your music production & recording questions directly. So, if you have questions about Music Production, Recording, Mixing, Mastering, Equipment, or just general music business questions, send your questions to me, and if they are something I think will benefit all my readers, I’ll post the answer on my web site.